Welcom to the official Paul Pabst web site. 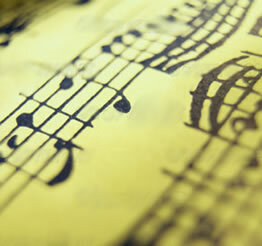 Please read about his work and listn to some of his music from our Recordings page. Please do not hesitate to contact us with regards to any of Pabst's works or site information, suggestions and corrections. 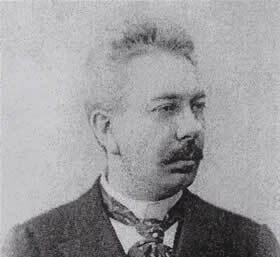 Christian George Paul Pabst was a German/Russian pianist, composer and teacher born on 15th May 1854 from Köenigsberg (now Kalinigrad the enclave of Russia surrounded by the E.C.). He died suddenly on 16th May 1897 in Moscow and was buried in the German Cemetery in Moscow. Paul studied piano with his father, violinist, pianist and conductor August Pabst later in Dresden and with Anton Door in the Academy of Music and Lyric Arts in Vienna and spent some time with Franz Lizst in Weimar. His performing career was established by the age of 11 when he accompanied touring the singers and violinists of the period. Paul’s mother, Pauline Condee was an opera singer, and brother Louis, pianist-composer who, after as spell at the Liverpool Philharmonic went to Australia and worked in the first Conservatoire in Melbourne where he taught Percy Grainger. From 1875 Paul Pabst taught piano in Riga, going to Moscow in 1878, at the invitation of Nicholas Rubinstein, to join the Moscow Conservatoire as a piano teacher. He was made Professor in 1881 and professor of the high degree in 1886 and he remained teaching at the Conservatoire until his early death in 1897. Married to Olga Gelink, also known as Alexandra Petrovna who survived her husband by more than ten years. Their childless marriage was a home, for a while, to Bouyukli, the illegitimate son of Nicholas Rubinstein and Polish pianist Lebedeva-Gertzevich, teacher of Sofronizkij . 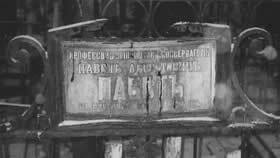 The change of the names of both Pabst and his wife suggest they were Jews who were christianized to allow them to work in Moscow. In the same way that both Anton and Nicholas Rubinstein changed their religion. Pabst was one of the greatest ever teachers of piano, his students formed Russian Piano School for the 20th century. No less than 8 Professors of Piano for Moscow and St Petersburg Conservatoires were trained by him. 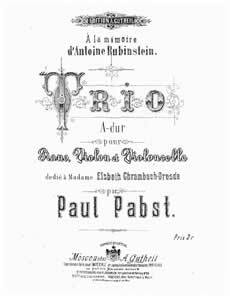 Pabst was deliberately denigrated and his music deemed worthless by the musical establishment, to protect the reputation of Tchaikovsky. Pabst was appointed by Tchaikovsky to edit and improve his piano works in 1884 and that Pabst is also the virtuoso that Tchaikovsky admitted (but never named) who assisted him in the completion of his first piano concerto . Pabst himself wrote a Piano Concerto opus 82 and a Trio dedicated to Anton Rubinstein. Tchaikovsky called Pabst “a pianist blessed by God” to whom he dedicated part of opus 72 - Polacca de Concert. Rachmaninoff was not a student of Pabst as he left the conservatoire after completing his lower degree. However Pabst provided the opportunity for Rachmaninoff to play with him the Fantasy Tableau op 5 for two pianos. In gratitude Rachmaninoff dedicated his opus 10 to Paul Pabst.